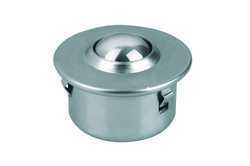 We are a leading Wholesale Distributor of ball transfer unit from Mumbai, India. To live up to the wide expectations of the clients, we offer the finest quality gamut of Ball Transfer Unit. Offered ball transfer units are manufactured under the vigilance of dexterous professionals using top quality components and sophisticated techniques. Due to its high strength and excellent durability, these ball transfer units are widely acclaimed among customers. Moreover, our prestigious clients can buy these ball transfer units from us at pocket-friendly rates. Looking for Ball Transfer Unit ?